When the time comes for a full-scale kitchen renovation, we’re willing to bet that you want quality outcomes that are both durable and cost-effective. While the flooring and appliances in your kitchen will be costly to replace, the cabinets will likely take up a large portion of the budget. One modern approach that provides amazing results at a fraction of the cost is cabinet refinishing. This process, offered by our experienced home remodeling contractors, is why Detail Design & Remodeling is in business today. 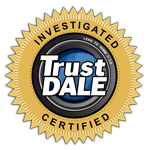 Our experts strive to provide the best cabinet refacing to Atlanta homes and beyond, delivering quality long-term results that are sure to revolutionize the look of your kitchen. Our cabinet resurfacing and refacing services aim to deliver updated results to create a vibrant space for your cooking and eating activities. When refacing cabinets, you will have a lot of different style and material choices to choose from. Our experts also excel at creating custom cabinets to perfectly match your kitchen’s needs and styles. Today, we’ll look into the common cabinet door styles to help give customers in deciding the exact outcome for their kitchen renovations. 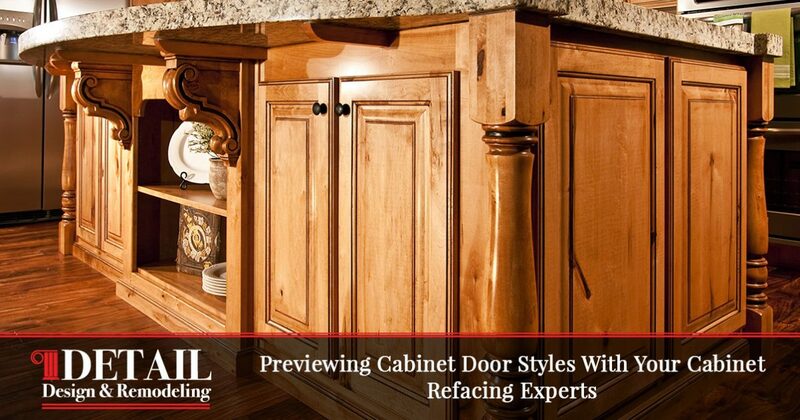 These cabinet doors are very prevalent in homes across the country, being a top choice for consumers for four decades. The chances are high that you have seen this traditional cabinet style before, consisting of a raised center panel that highlights the profile or contour of your door for a stylish, classy appearance. Raised panel doors thrive with carved detailing that creates depth for your cabinets, drawing on versatility to match a wide range of styles. Homeowners can count on raised panel doors to boost aesthetics, whether they are seeking a traditional or transitional kitchen style. Flat panel (or recessed panel) cabinet doors provide a sleek profile for the modernists in the world. Homeowners who are looking for a sturdy, versatile design can benefit from flat panels, as these pieces are known for their ability to work seamlessly with contemporary and transitional styles. Recessed panel cabinets can be painted or stained to match a wide variety of designs, giving you the power to create dynamic visual patterns both now and in the future. The clean aesthetics of this style also benefit your cleaning routine, as the lack of contoured edges creates a flatter, smoother surface. While not nearly as classy as raised panels, this approach can prove to be ideal for your plans and style. Those who prefer the simpler things in life can benefit from slab cabinet doors. As the name describes, this style consists of a solid door that is more like a slab than anything else. Slab doors are solid, singular pieces, consisting of no frames or panels to break up the seamless surface. The hardware is not present on the front side of this door style, as attachments are made to the sides to ensure a completely smooth face. When utilized properly, these doors are perfect for a wide range of styles, from transitional to modern and more. If you are considering this style for your kitchen cabinet renovations, our experts can assist in creating a dynamic design plan to enhance every aspect of your kitchen! If you can dream it, our builders can do it. Mullion panels offer a diverse array of style choices, creating customized solutions for all of your cabinets. This cabinet style is easy to recognize due to the open center, often with narrow edges or frames to help hold the glass in place. Open-framed styles are similar to mullion frames in that the purpose is often to display your cabinet’s wares without compromising the safety of those products. When utilized correctly, open frame cabinets greatly enhance the design of the room, offering a spacious feel that can highlight the cabinet’s contents for greater effect. When it comes down to it, your cabinets can benefit from a very diverse range of styles and setups. Each style described above can be customized to create a truly perfect fit for your kitchen’s unique style. Detail Design & Remodeling is proud to be your go-to source for custom cabinet refacing in Atlanta and Dunwoody, delivering amazing results that are as aesthetically pleasing as they are affordable. We can do a walkthrough of your kitchen and offer advice, support, and knowledgeable design suggestions to create a stunning new visual dynamic. Contact us today to learn more or to receive a quote for your cabinet refinishing project!